We are in the confidence-building industry. It is our job to ensure that the bride looks and feels beautiful on her special day. Many brides believe that airbrush is the best option. You must be prepared to invest in the training and purchase of an airbrush compressor and products; your initial investment will pay off within one or two weddings, and you will be able to make a profit before you know it. The first question I am asked when approached by a bride is: “Are you available on my wedding day?” The second question I am asked is, (of course), “How much do you charge?” Once we get through those two questions, the bride will ask, “Do you use airbrush makeup?” The answer to this question must be “yes”, if you want to get the job. In fact, the bride is going to insist, more often than not, that she must be airbrushed on her wedding day. Airbrush is a useful tool and is widely used at the School; in fact, Airbrush and Airbrush Camouflage is offered as a workshop at the School. Airbrush makeup (water-based) is actually my foundation of choice for brides who have acne and/or want to camouflage large tattoos (alcohol-based). However, with the recent technological advances in traditional foundation formulation, it is now possible to achieve that flawless airbrush look by using manual makeup. Brides may not believe it; they still may insist that they need to be airbrushed. Cardinal rule: DO NOT ARGUE WITH THE BRIDE! Be sure to become skilled in airbrush makeup application so that you will be booked for the wedding! However, also be sure that you are learn product ingredients; certain manual products, as well as high definition techniques will permit you to manually create the flawless complexion without the use of airbrush. We should all be able to apply a perfect makeup application, with or without use of airbrush foundation and equipment. Following are the benefits of airbrush makeup and how those can easily be achieved using traditional products. 1. Speed- It is very fast to airbrush the foundation on a face; you can also very quickly apply manual makeup once you have practiced, especially if you use foundations with which you are most familiar. 2. High Definition-All media is now in high definition. Airbrushing with either a silicone or water based foundation is perfect for high definition technology. However, if you select the proper materials and execute the manual makeup in thin layers, the skin will still look flawless in high definition. 3. Durability- Airbrush makeup is long lasting. However, if the face is properly prepped and primed, and the foundations selected contain silicone or wax, the makeup will be durable and water-resistant. 4. Touch Ups-To touch up a water-based airbrush application, the artist will need to redo the entire face; otherwise, the touch up will result in an uneven application; i.e., the “seal” will be broken. To touch up a silicone-based airbrushed face, there is a little more flexibility to move the product before it dries. However, once dried, the silicone, airbrushed face will also look uneven if there are foundation touch ups after the initial, dried application. On the other hand, with manual makeup, touch ups are easily blended with the original foundation applied. 5. The Kit-this is a no brainer-it is much lighter to carry a makeup kit that does not have an airbrush compressor and products. Most makeup artists have a separate kit for their airbrush compressor and products, which they may or may not need to carry with them on all jobs. In short, while one must know how to apply airbrush foundation, the successful makeup artist must also work on learning how to duplicate that flawless finish with manual makeup products and techniques. 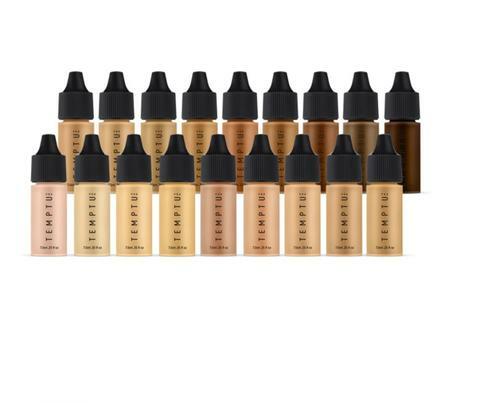 Temptu S-One Starter Kit ($325) For the artist that needs power and precision to perform, with a wide breadth of foundation shades for all skin tones. Temptu S-One Premier Kit includes: S-One Compressor, SP-35 Airbrush Gun, Airbrush Cleaning Kit, 12 pk S/B Foundation 1/4oz. Set, S/B Cleaner. Temptu Air ($195) is the first cordless airbrush makeup device for instant, effortless skin perfection. Our patented technology delivers less makeup and more complete coverage than makeup brush application. Airpods sold separately. With Temptu's new release of the 24-Hour Hydra Lock Airbrush Foundations, now airbrushed brides will enjoy the best of both worlds; the water will hydrate the skin, while the silicone will increase the durability of the airbrush foundation. Skin appears healthier, younger, and more radiant-looking with this long-wear, transfer and water-resistant formula that delivers the most natural skin-like finish and build-able coverage - sheer, medium, or full! Want to learn how Airbrush? Upcoming Airbrush and Airbrush Camouflage Workshops are right around the corner! FOCUS ON MALE GROOMING - AND GREAT VALENTINES DAY GIFTS FOR THE MEN IN YOUR LIFE! School Is Back In Session at Make Up First®!